Most of us have been shaped by words spoken to us in anger or impatience or from another person’s broken perspective. Who of us didn’t have some kid or kids at school tell us we were stupid, lame, ugly, fat or unwanted for some reason. I know I did. Repeatedly. Statistics show that most children have also suffered from the criticisms, insults and abusive words flung at by overwhelmed, scared or generally messed up parents (aren’t we all?). Many of us have felt the abandonment or rejection divorce brings. Four out of five have been exposed to some type of sexual abuse. Is is any wonder we struggle to understand who we are? God created us with a specific design and plan for our life. (Yes, even you.) He delights in the unique personality that makes us, well – us. He knows every nuance, every tilt of our head, all the abilities we possess and what makes us smile. And he loves it when we exhibit those traits. No wonder Satan, the enemy of God and us, whispers lies, uses the wounds others have pressed on us, and creates circumstances to distort the beautiful creation of God that we each are. But how do we find out who we are and become ourselves again? 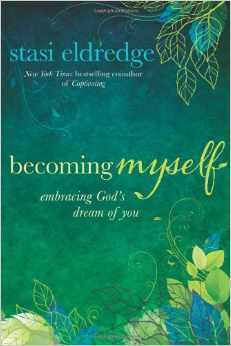 In her most recent book, Becoming Myself: Embracing God’s Dream of You, Stasi Eldredge shows us how. Becoming Myself takes us straight to the throne of Jesus where we are loved, delighted in and encouraged. As we read, we are transformed by the renewing of our thoughts about ourselves, our God, our relationships and our world. With intimately honest stories that come from the depths of her heart, Stasi reveals how we can see ours more clearly. While her primary audience is women, every person needs what God shares through Stasi in this book. It tops my “must read” list of books. It’s not only enjoyable and entertaining, it is a life-changing read. In what ways have you lost yourself? How have you learned who you were truly meant to be? Thanks ..this is good and thought provoking, by God’s grace I am trying every day to know myself better through Him…God Bless!